Welcome to episode 75 of our kidlitwomen* podcast! Every week this podcast will feature an essay about an issue in the children's literature community (Monday) and a discussion about the essay (Wednesday). 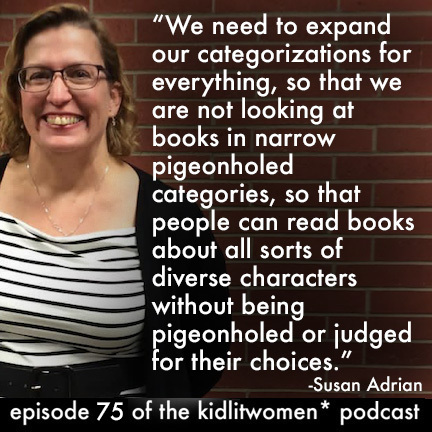 In this episode, Alvina Ling and Susan Adrian discuss Susan’s essay, “‘Boy’ books vs. ‘Girl’ books: How do we stop the labeling?” You can hear and/or read Susan’s essay in episode 74. Alvina Ling is VP and Editor-in-Chief at Little, Brown Books for Young Readers (a division of Hachette Book Group) where she has worked since 1999. She edits children's books for all ages, from picture books to young adult. She has edited such books as A Big Mooncake For Little Star by Grace Lin; Mr. Tiger Goes Wild by Peter Brown; Dave the Potter by Laban Carrick Hill, illustrated by Bryan Collier; Where the Mountain Meets the Moon by Grace Lin, The Land of Stories series by Chris Colfer, The Candymakers by Wendy Mass, Daughter of Smoke and Bone by Laini Taylor, and The Cruel Prince by Holly Black. She Tweets with the handle @planetalvina and is on Instagram @alvinaling and is also the co-host (with Grace Lin) of another podcast, Book Friends Forever. alvina: Hi. I am Alvina Ling, talking with Susan Adrian about her essay, Boy Books versus Girl Books: How Do We Stop The Labeling? About how kids' books are so often categorized into two camps, for boys and for girls, and then, marketed that way. Susan, thank you for joining me today. susan: Happy to be here. alvina: Okay. So my first question is, why did you write your essay? susan: It was very personal for me. I was struck by the difference in reception between my first two books, which are young adult thrillers with a male protagonist, 18 year old male protagonist, And my Nutcracker book, which was a middle grade with a 12 year old female protagonist. And even without real overt marketing clues, people seemed to self limit. So I constantly got comments that, "I would buy it, but I don't have any girls to buy it for." So it just struck me, the vast difference. People, adults, were willing to buy the YAs, boys, girls, everyone. But, the middle grade, they really seemed to feel like it was only supposed to be for girls. And then, I read posts about this issue by Shannon Hale, who's written some wonderful things. You should read those if you can. And I started to realize how prevalent it was. It's really everywhere in the industry. alvina: I think that's so true. I obviously work at a publishing company, and there is always the discussion of, well, girls will read books with boy protagonist, but boys won't read "girl books". And it's frustrating for sure. I'd mentioned this in another interview I did, but did you see that story about ... I think a bookseller Tweeted about a young boy who picked James Patterson's book, Jacky Ha-Ha, off the shelf. susan: I did not. No I did not. alvina: The bookseller said that this young boy picked Jacky Ha-Ha, and then the dad looked at the description and said to his son, "You know this is about a girl, right?" They bought the book anyway, but the dad needed verbal confirmation from the boy, who obviously felt uncomfortable, but I'm glad he was able to say yes, and ... it's just a shame. susan: And I actually used to be, before I was an editor and a writer, I was a book store manager, and I'd see that all the time. A lot of kids don't really feel comfortable challenging their parents or challenging their gatekeepers. If they're told that a book isn't for them, they just go with that judgment, and then they're missing out on so much. alvina: They are for sure. I hope we can change things. You talk about a little bit in your essay. susan: Yeah, I hope so too. alvina: Is there anything that you're afraid people have or will misunderstand about your essay? susan: I think the only thing I was worried about is I didn't want people to think that the publishers' intentionally pigeonhole the books, because as you say, I know they don't they do that either, they want as many people as possible to read the books. It wasn't like they were trying to limit the second book to girls. The only indication really, is that there's a dancer on the front. So I just wanted to clarify there wasn't a publisher doing that. In my experience, it's gatekeepers that are limiting it. alvina: ... I think. We do have what we call a cover positioning form that the editor fills out, and we used to have ... it'd be questions like, is this middle grade or YA, is there adult crossover, does the author want faces on the cover or no. Things like that. But one of the questions we used to have on the form was, is this a book that directed towards boy or girl readers? I recently decided to strike that from the form. alvina: That's my small little rebellion. alvina: I do think that we all need to take our role, in trying to change this. alvina: Absolutely. What was the hardest part for you personally in writing the essay? susan: Honestly, it was trying to come up with some way that we can address the problem. Because I'm very aware that there is a problem, and I think a lot of people are aware that there is a problem, but when I try to think, I didn't want to just write an essay about the problem, and not have something that we could actually do to address it. So that was what I struggled with really, trying to think of how we can address it, and I think it's honestly a matter of realizing our own biases, because we were all raised in this culture, where we tend to see things in binary form, and we need to consciously ... I think we have to work to step away from that. That was the hardest thing, is trying to find some action, but I think that we can make little changes. It's a big problem, and I think change will probably be incremental, but you just took a step by crossing out that requirement to list something, and it will change if we all make little steps where we can. alvina: ... so the fact that Wonder Woman was such a hit and surprised Hollywood with how [inaudible 00:05:39] it was. The fact that girls want to see superheroes, but boys do too. alvina: So I think that will help, all these little things help for sure. susan: And I think awareness helps too, just being aware of it makes a big difference. alvina: I liked your suggesting, or the fact that you tried to take that [inaudible 00:06:00] when you're giving gifts or giving book recommendations, and I try to do that as well. Let's all do that. susan: Let's all do that. alvina: What did you consider adding to your piece but then chose to leave out, if anything? And why did you leave it out? susan: Actually I don't really have an answer to that one too much, either. I think that ... I don't really have an answer. alvina: That's fine. I think we already addressed this to some extent, but how do you hope the world of children's publishing will change in the future, related to this topic? susan: I really do hope that as a larger picture, we can add more diversity, which is of course a huge movement. We need diverse books in the industry right now, with more books published by authors of color, LGBT authors, and authors with different neuro types or disabilities. But I also hope that we manage to break out of the categorization of books. As we talked about, I think it's a disservice to [inaudible 00:07:05] books as boy and girl, but it's also a disservice to necessarily tag a book as LGBT and only LGBT people should read that. We need to expand our categorizations for everything, so that we are not looking at books in narrow pigeonholed categories, so that people can read books about all sorts of diverse characters without being pigeonholed or judged for their choices. alvina: ... I think marketing that book only for black readers or Asian readers, that's a big problem. I agree, and I do think we are, the industry is changing, but change can be slow. I've been heartened by the progress. susan: I think over the past few years, we've started to really make some progress in that direction. At least I hope so. alvina: I agree, and I think all these kidlet women posts and essays, and discussions have been ... it can be scary, I know that Grace and I talked about how ... I'll be honest, I didn't even write an essay, because I couldn't really think of a good topic, but also I think as an editor who works in a publishing house, I was a little bit nervous about, well what can I write about that is appropriate and moves the conversation forward without ... I don't know. susan: You have a lot of power in spreading your message, so it makes sense that you'd have to be a little more careful. alvina: But it was really just great to see all the posts coming in, and I'm really glad to have been a part of it. All right, is there anything else you want to talk about in terms of your essay, or this topic? susan: I do want to talk a little bit about gatekeepers. I think there's a difference in ... I think we're making more advancements in this realm in YA a bit, I think because teens pick their own books for the most part. And really the issue that I see is not the children themselves, as we discussed a little, it's not the children picking out their own books. They seem perfectly willing in most cases, to pick out any book. It's the gatekeepers. It's the parent standing next to them. The librarian, sometimes, the teachers do that a lot. Shannon Hale talks about that a great deal. And booksellers too. So I think that's actually where we need to look at spreading awareness and making sure that people do make different recommendations, is the gatekeepers for younger kids. alvina: Yeah, I definitely agree with that. I was a bookseller at Barnes and Noble, and I will admit that when someone asked me, "Oh, I'm looking for a gift for a child," and I would ... my first question would be to ask is it a boy or a girl. alvina: Really. That should not be necessary to ask. susan: It's really easy to fall into that when you're making a recommendation, it's so easy to just try to pigeonhole it down, when it truly should be whether it's a good book or not. alvina: Right. I definitely have been making more of a point too, to give books with girl protagonists to my nephews, and vice versa to my niece. I think anyone who either has children or deals with children, if you just put down a bunch of books in front of the kids, it's just interesting to see which books they're drawn to, and usually it has nothing to do with the gender of the characters. susan: Yeah, for sure. They seem to just pick out what's interesting to them, and they're not necessarily looking at gender as much as we think they are. alvina: I wonder if to reach booksellers more, I guess this could be a panel topic at book expo, or winter institute, or that kind of thing. It could be something, because I don't think these things are generally talked about that much. susan: It's true. I do think there generally are diversity panels these days, but yeah, I think this gender and sexism should be incorporated in all of that for sure. alvina: I think that's a great idea. I think that would again, be one of those little steps that we can take that'll make a difference in the end. susan: Yeah, and I do think that the ... proving our point is successes, so I think we showed that teen boys will read about a girl, with Hunger Games, for example, so I think the more successes we have like that, the better. susan: Wonder Woman for sure. alvina: I know. I was just talking to some friends last night about how they are not going to make a Princess Leia Star Wars movie, or at least not ... it wasn't on the initial slate. And that just seems like such a ridiculous decision. alvina: I think that would do amazingly well, especially if they're doing a Boba Fett movie, it's like why Boba Fett and not Leia? Anyway, it's frustrating. susan: Everybody likes Rey, so if some of the Star Wars female protagonist movies have to have done well. susan: True. It's a imperfect world we live in. As we all know. alvina: All right, I have two final questions. The first is a self-promo closing, just give me an elevator pitch of what you're working on right now, or your newest book. susan: I have one coming out, Forever Neverland is a fantasy middle grade, that's coming out in summer of 2019 with Random House. It's actually dual point of view. It's about an autistic boy and his somewhat bossy older sister, who visit their estranged grandparents in London, and they discover that they're descendants of Wendy from Peter Pan. So Peter whisks them away to Neverland for an adventure with pixies, mermaids, a sea witch and a Greek goddess. alvina: That sounds amazing. What is the title again? susan: Forever Neverland. It'll be out summer 2019.
alvina: Great, okay, and then the last question is, what is your biggest publishing dream? Big and goofy. susan: It is being goofy. It's long term. You know how some people imagine their funerals, and who will be there, and what people say about them, or maybe that's just me, I don't know. In my ideal reality, when I am very, very old, I will get some sort of lifetime achievement award for creating classic kids' books. That's my dream, and 50 years from now, maybe some kids will still be reading them. That's ideal. susan: I don't want to get too specific. I've got to leave myself open. alvina: I guess a big publishing dream that someday, like book awards, will be as big as the Oscars. That'd be nice. alvina: Great. Well, thank you for joining me today Susan. susan: Thank you so much. I really enjoyed it.